How to be nice about our own work? Are you one of those people who sees only flaws when looking at your work? I certainly tend to be! We are our own harshest judge. It doesn’t matter if it is for art or writing, I tend to find my work terrible. It doesn’t help that for the longest time I believed that only the best artist would make it. I do think, however, that a positive attitude is a better way for life. I might not be the best in this and I probably never will be, but I did work on loving my artwork a little more. Here are my tips on how I did that. I hope one of these resonates with you so you can learn to appreciate your own work. It is so easy to find the many mistakes in what I have done. When my faces don’t have enough expression and my colour don’t seem to fit, I seem to notice it in a second. When I re-read my blog posts I can see the many mistakes. My lack of atmosphere and feeling bother me late at night. I can see all my mistakes but ask me what I did do well and I get stuck. I don’t hate my own artwork. I really don’t. It is a part of me. So recently I started to try and find 3 things in everything I create that I did do well. Did I choose a good subject? Did I blend my colours nicely even though it weren’t the colours that I wanted? Did I word that one feeling extremely accurately? All these things make me look more closely at my work and appreciate my own effort more. Nobody is perfect and nothing I create will ever be perfect. It might be harsh, but it is true. As long as I realise that every work I make is a step closer to being as good as I want to be I can accept a lot of failures. Learning is a process that keeps going. Every time I make something it will be a step closer to my goals. It is a no-brainer, but I find myself doing it every time. When I see amazing artists sometimes I just think about how I’m not that good. I worked hard on not doing this and now most of the times I just see it as inspiration. These people probably just have worked very hard for years and I can do the same. Seeing other people’s work as inspiration also really helped me to get a vision of what I want to do with my art and what looks I want to pursue. 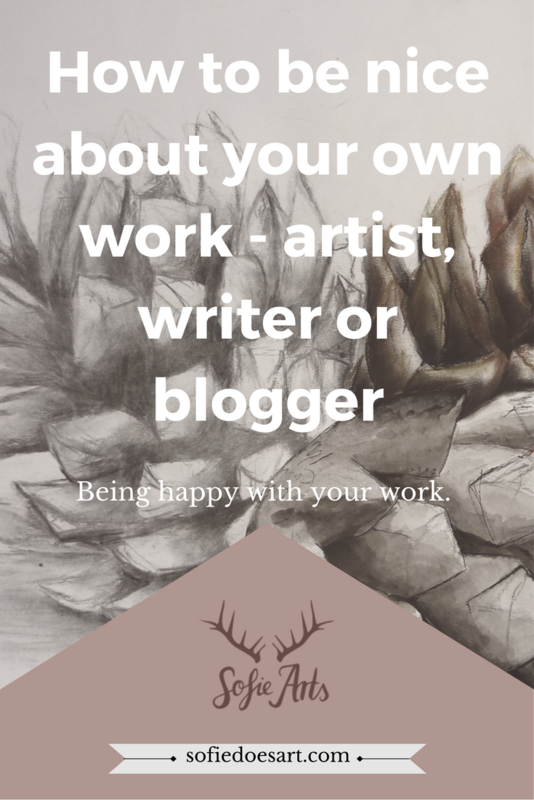 For writing, I mostly look at other bloggers. I really admire bloggers who can describe a walk in the park and who can still keep me captivated. Instead of just getting frustrated that I can’t do that I like to look at what kind of sentence I really like and how these people create an atmosphere in their stories. As I said before in finding the right blogging style, I tend to struggle with writing more personal stuff. Since I wrote that I have started to include a lot more feeling and personal stories and I hope that that is showing. Am I contradicting myself? You are the best version of you (also the only version of you) and I believe that I can only get better. You can get lost on your way to better, but no human ever becomes less. One of my favourite ways to feel better about my art is to see my old work. I think I made quite some progress over the years. Luckily all my old work is still online for everybody to enjoy… When I feel like I’m not making progress it is always great to see where I came from. So just so you can see where I came from; here is my old DeviantArt account and an old work that really gets me thinking. I do like some of the photos that I left there and I’m certainly thinking of using those again. For this same reason, I think that doing a draw this again challenge (in which you re-create an old work) is an amazing way to see how you are doing and to feel better about where you stand now! Obviously, you don’t have to do all of this at the same time and maybe this doesn’t work for you. Even if it works for me there are still moments where I feel discouraged. Nobody is perfect and flaws are a part of life. It is not bad to notice them as long as you use them to improve. Just don’t let them get you down! So let me know where you stand. Are you entirely confident in your are or are you struggling like me? How do you keep going and do you have any tips? You’ve worded that beautifully! Amazing words to live by I think. All artist and writers have an inner creative struggle to release the words, thoughts, ideas, forms, color, and structure within the vision they possess. I have certainly been working on leaving perfection behind and embracing the creative mind that I have to simply create. That is really hard because I am a perfectionist. You really can’t compare yourself to someone else. They have their own journey to overcome while I am working on mine. It makes sense to make a comparison to yourself on the personal growth and empowerment that comes with the creative process. Thanks for an thought evoking post! I think this is indeed especially​ hard for perfectionists. Maybe art isn’t perfect but only growth. we need more artists/writers to shout out to say – compare yourself to Your own self! and we are all in stages of Learning… be Kind to Yourself – so thanks for reminding people 🙂 we all need to hear this….. lots !! I’m glad you find it as important as me. It breaks my heart when I see newer artists stressing because they are not as good as someone who has been doing that for over a decade!